This project is aimed at developing an alert system which notifies shop owners and managers of products/inventory which are about to expire. Faced with the challenges shop owners face with loses and health hazards brought about by expired products, the researcher aimed at developing a product/Inventory Expiration system that manages product expiration in a computerized manner. The Product expiration management system notifies/alerts the store manager on products expiring soon for prompt attention and decision. The system was built with PHP, MYSQL and Bootstrap Technologies. Products are considered as the business resources for the organization. This includes managing the product with appropriate way to review any time as per the requirement. Therefore, it is important to have a web-based Product Expiration System which has the ability to generate reports, report products expiry dates, maintain the balance of the stock, details about the purchase and sales in the organization, which helps to minimize loses to the business or negative health hazards to consumers. These web application can be used by large or small business organization for the management of their stock in the production houses. After analyzing the other Product Expiration systems, we decided to include some of common and key features that should be included in every Product Expiration system. The Product Expiration System is a complete web-based application designed with HTML, CSS and PHP technology. The main aim of the project is to develop Product Expiration System Model software in which all the information regarding the stock of the organization will be presented. It is an internet based application which has admin component to manage the inventory and maintenance of the inventory system. This application is based on the management of stock of an organization. 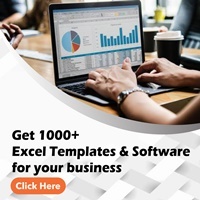 The application contains general organization profile, sales details, Purchase details and expiration dates presented in the organization. There is a provision of updating the inventory also. To develop the easy management of the inventory. To handle the inventory details like purchase details, manufacturer details and expiration dates of Products. To maintain a record of batches of product brought to the store. To keep a record of product brought to the store. To detect about to expire and expired products in the store. To calculate the loss on expired products. Health hazards to consumers and huge loss to businesses have been the major challenges posed by expired products. Manually taking stock of products by small scale/medium scale business owners are still prone to human errors. When consumers are exposed to expired products, they may have various health challenges ranging from stomach upsets to food poisoning (which may result to death). Apart from law suits the shop owner may face, he/she will be losing money if the products in the store expires without his/her notice. These challenges are the main reasons the researcher sought to develop a computerized system that notifies shop owners and managers of impending products that are about to expire. This system is significant in the sense that it will curb loses and prevent health hazards to consumers. 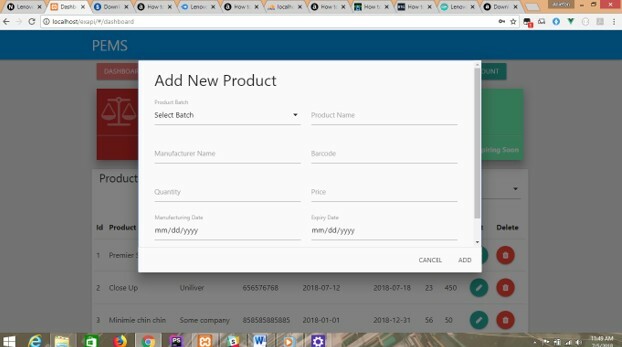 To develop a web Product Expiration system to assist business owners take stock and regulate product expiring dates, solves the tedious work and activities in calculating and taking stocks of large product for large business owners in which they end up missing expiry dates, mis-calculating and discarding some important figures, with this Inventory system, business owners can now take stock, check product expiration dates, calculate their products left with just a click. The system can aid Shop owners and managers make prompt and informed decisions of products that are about to expire. Clearance sales, Immediate Consumption of Products, Gifting of Product etc. could be good measures that can be taken to minimize loss to the business or prevent health hazards to consumers. 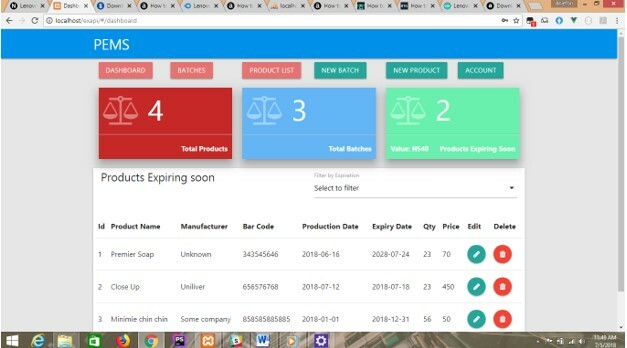 Product Expiration System is targeted to the small or medium organization which doesn’t have proper records of their products, also for those organization that deals with products that expire, a proper system to keep track of product expiration is important. The study will focus primarily on Shoprite Mall Enugu. Inventory - a complete list of items such as property, goods in stock, or the contents of a building/ warehouse. Stock - The goods or merchandise kept on the premises of a shop or warehouse and available for sale or distribution. Product- an article or substance that or is manufactured refined for sale. Expiring date- date of shelf life of a product. Might still be safe, but quality is no longer guaranteed. 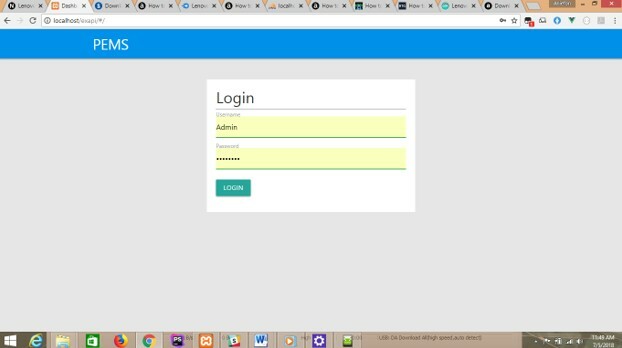 Web application – A web application is a computer application program that utilizes web browsers and web technology to perform takes over the internet. Transaction - an instance of buying or selling something.